This 2 day course is recognised by the National Governing Bodies (British Canoeing, British Cycling and Mountain Training). 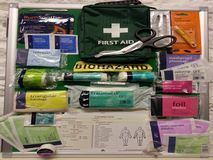 This course is suitable for those wishing to have extended skills in wilderness first aid to help a casualty in remote areas and to take control of an incident in a hazardous environment. Successful completion of the course results in a first aid certificate specifically focused toward outdoor activities.